A beautiful combination of natural and modern elements. Product Description Modern Minimalism. 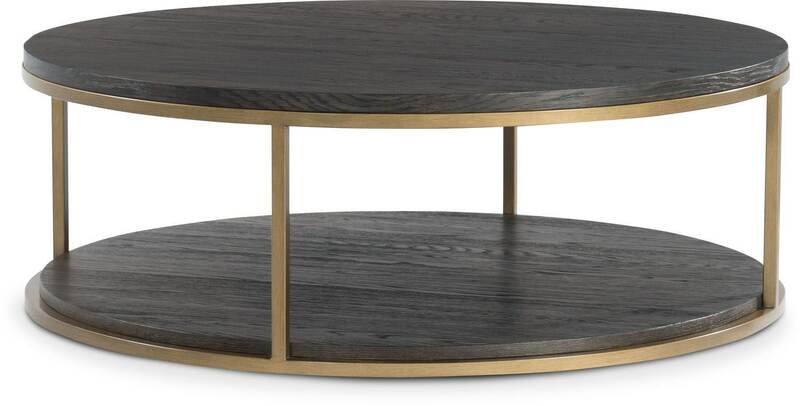 Contrasting design elements effortlessly combine to form the stunning Malibu round coffee table. With the look of a high-end gallery piece at an affordable price, this table brings sleek, modern lines and natural elements together to command the room. A warm brown finish amplifies the natural grains found in the wood, while open storage space provides plenty of room for showcasing your favorite collectibles. Unique Features: Warm brown finish accentuates natural wood grains. Contrasting metal base and frame add modern tone. Open shelving offers storage for magazines or books. Construction: Constructed of strong rubberwood solids, oak veneers and metal for long-lasting durability.